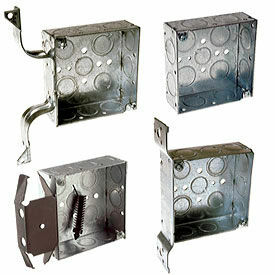 Square Boxes Can Be Installed In Walls Or Ceilings For Light Fixtures, Switches Or Receptacles. Boxes are made of .0625" thick pre-galvanized sheet steel. Square boxes are used where multiple connector runs are split into two or more directions to bring power to a number of electrical devices. Drawn boxes are used for exposed work applications. 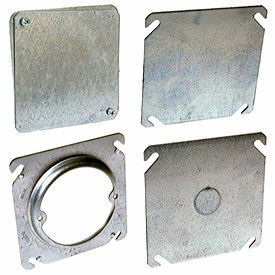 Combination screw heads allow fast installation. Knockouts allow greater flexibility. Red Boxes are available for dedicated life safety alarm circuits. UL compliant.